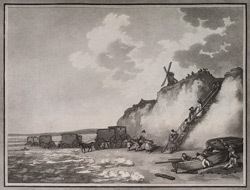 In the late 18th century, the previously declining town of Brighton became a popular resort for wealthy invalids. Its fortune was transformed when Dr Russell wrote his 'Dissertation concerning the Use of Sea Water in Diseases of the Glands' in 1750, advocating the health benefits of bathing in seawater. Fashionable people came to Brighton in large numbers, following this new trend for sea-bathing as a restorative. Visitors commonly used bathing machines such as those pictured. These enclosed wagons were boarded on the shore and then taken out to sea. As can be seen in the print, the weather was not always conducive to bathing. The drawing is in the caricatured and knotty style associated with the works of Thomas Rowlandson.